Do your walls seem barren and empty? Need something that adds not only detail but also character to your surroundings? Well, look no further than our fantasy art scrolls section! Vivid color and fine art ensure that each and every scroll, whether gothic and gloomy or medieval and magnificent, is a true work of art! Each and every scroll in this section features stunning imagery and offers a vibrancy of color that makes said-image come to life. The images are stained, dyed, and emblazoned onto fabric scrolls that are most often made in polyurethane fabric to for lasting life and color. 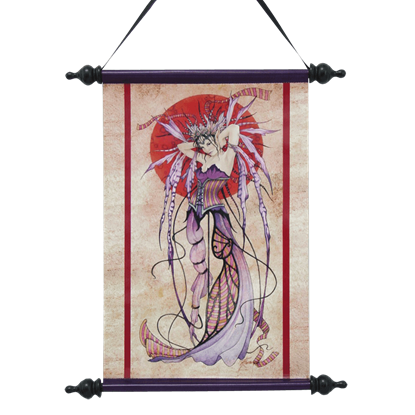 And better yet, these handsome scrolls are also easy to hang, making it a snap to bring something colorful and fantastical into your life! Want something dark and gothic? 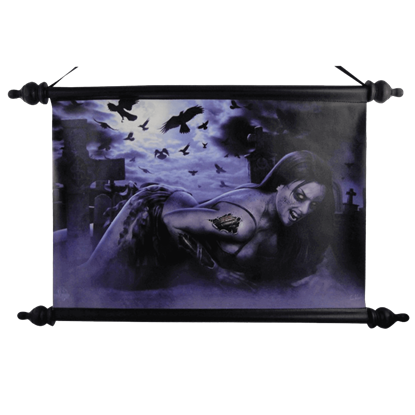 Try a wall scroll with a werewolf, a moonlit night, or a vampire on it. Prefer classic fantasy? 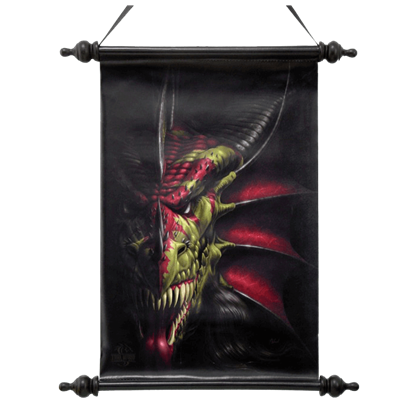 Seek ye dragons and fairies for your wall scrolls. Amazed by the work of known fantasy artists? 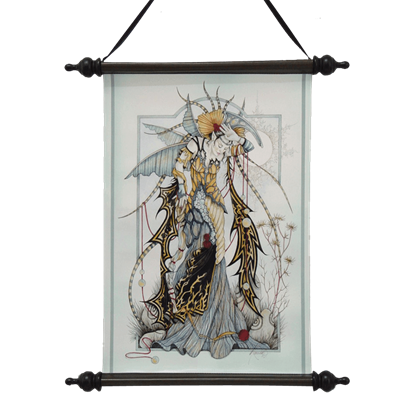 Check here, because we likely offer their art in scroll format for you to hang and display! 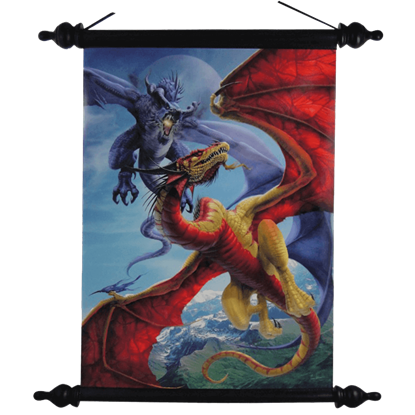 So if you have got a 2-foot by 1-foot opening on your wall, you have all the room you need to bring some affordable and amazing fantasy style to your decor, in the form of one of the fantasy wall scrolls found right here. Sometimes, a bit of Celtic style is what you need to brighten your day and decor. 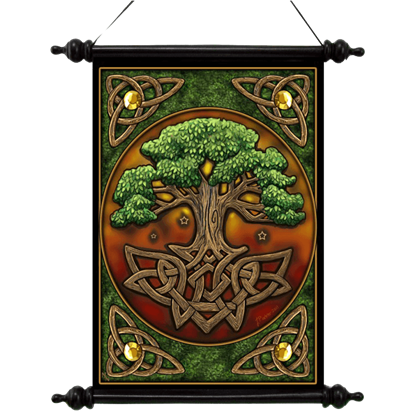 This Celtic Tree of Life Art Scroll is the perfect way to bring just that into your home, thanks to its colorful design and its easy-to-use form. It takes courage to face a dragon in battle and even more to get this close! 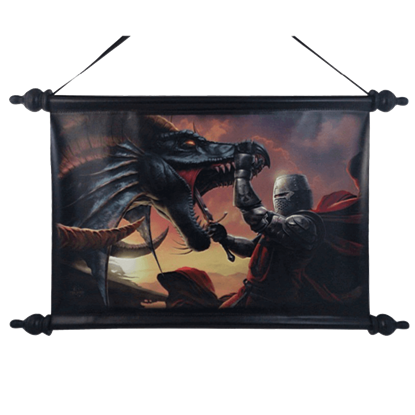 This Dragon Slayer Art Scroll depicts a dangerous but effective way to slay a dragon and the courageous knight who was brave enough to make the attempt. Looks can be deceiving sometimes. This is not one of those times, though, because as pretty as this ghoul in this Graveyard Zombie Girl Art Scroll appears, she is still undead and, thus, dangerous to the living. Only a fool would confront a dragon in its lair, where the dragon is fully secure and aware of its surroundings. Even a dragon can come out of nowhere from the shadows, as this Lair of Shadows Scroll by Tom Wood demonstrates. Sometimes, you need a touch of fantasy in your life. If you should find that your life is lacking imagination and fantasy, all you need to do is put some back in with the Moonstone Enchantress Scroll by Linda Ravenscroft. Stunning art comes in all shapes and forms. 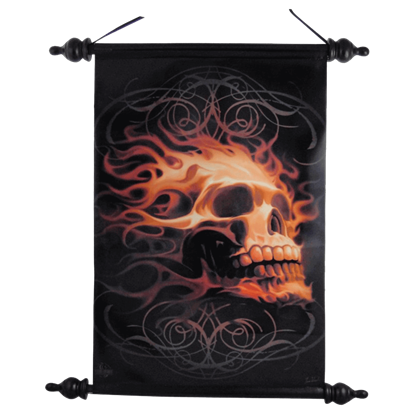 This Ornate Fire Skull Art Scroll reproduces a work for all to enjoy, using the tantalizing allure of flames and elegant line work to draw the eye and hold the interest of those who see it. This pale rider takes to the battlefield with ease, eagerly awaiting the chance to spread mayhem and chaos. 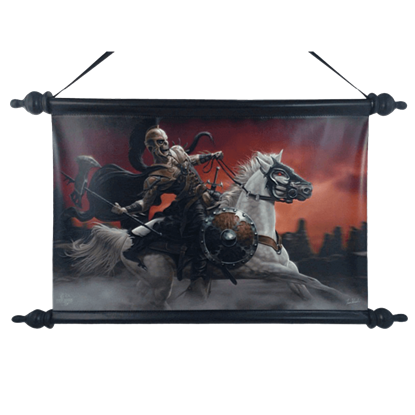 The Skeletal Dark Knight Art Scroll depicts a warrior who will not let a little thing like death keep him from fighting. Traditionally, slash and burn is a term applied to agricultural land clearing techniques, but in the case of this Slash and Burn Battling Dragons Art Scroll, it is also a term that applies to war fought between two great sky-beasts. Sometimes, you need a touch of fantasy in your life. If you should find that your life is lacking a little imagination and fantasy, all you need to do is put some back in with this Witching Moon Scroll by Linda Ravenscroft.